Address: Higher Education Regulatory Authority (HERA), No. 1, Tariq Road, Near Rescue 1122 Headquarter, Cantt Railway Station, Peshawar Cantt. 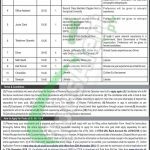 Tap this page for Higher Education Regulatory Authority Peshawar Jobs 2018 ETEA Application Form from www.etea.edu.pk which is the official site of Educational Testing & Evaluation Agency. Jobs in HERA Peshawar Higher Education Regulatory Authority are available and it is seeking for highly educated, very experienced, hardworking and well-disciplined candidates for the following positions which are available below. HERA Jobs are (Accountant, Personal Assistant, Data Entry Operator, Office Assistant, Junior Clerk, Telephone Operator, Driver, Naib Qasid, Dak Runner, Chowkidar, Sweeper). Appointments of above-mentioned positions will be done on contract basis and duration of the contract will be one year and it is extendable on satisfactory performance in Higher Education Regulatory Authority, Peshawar. Candidates willing to apply are suggested to compare themselves with the eligibilities mentioned in the following image and according to that candidates should have any of the following qualification BBA/B.Com/FA/FSC/D.Com/Matric with relevant skills and experience is required. For those candidates meeting criteria we provide how to apply procedure in the following heading so read it carefully. For Sr. No. 1 to 4 candidates is required to apply the Application form from the given website as www.etea.edu.pk. Application forms on www.etea.edu.pk shall be available with effect from 25th November 2018. The last date for submission of online applications will be December 13, 2018. The last date for submission of application at HERA Peshawar is 30th November 2018. Last Date to Apply for Sr. No. 1 to 4: December 13, 2018. Last Date to Apply for Sr. No. 5 to 11: November 30, 2018.